A near-fatal shot through his chest teaches Lieutenant Bryan Smyth of the NYPD two things: He wants to live to see more days and he wants to spend them with his estranged husband, Justice. Poor decisions made under the strain of grief split the seams of their marriage. Now it’s up to Bryan to show Justice there’s still enough of their love left to salvage from the ruins, still something worth the battle ahead. Bryan’s shooting has opened Justice’s eyes to new lessons too. The first, tomorrow isn’t promised, the second, life’s too short to live in misery. Justice has watched Bryan shuffle back and forth attempting to balance the man he is at home and the man he has to be at the precinct for too long. Now, he’s done. The only problem is, Justice’s heart is having a hard time adhering to the exit strategy in his head. Desperate to repair their bond, Bryan does the only thing he can to keep his marriage intact, he calls his crazy sister-in-law, True to stir up some organized chaos. She’s a wildcard, yes. As unstable and deadly as nitroglycerin, but she gets the one thing Bryan needs more than anything, results. The only question left: Is family and fidelity enough to get them through love’s changes, or is this really the end? I fell in love with both Bryan and Justice. These two men are both so strong, have strong jobs( one a marine the other a cop and former marine) but they lack one thing in their relationship…. Communication. These two men have experienced so much hurt in the past in their relationship when they lost their daughter. It affected each men differently and instead of turning to one another they handled their grief differently. Because of their lack of communication their marriage is on the rocks and it may not be able to be fixed especially since Justice has decided it was time to file for a divorce and put an end to their pain, heartache, and hurt from one another. This book is a perfect example of what the lack of communication and thinking what the other feels instead of actually talking about it can end up ruining a perfectly happy marriage. It is an example that no matter how long u have been together that no one is a mind reader and we can all misunderstand what the other is thinks no or feeling if we do talk to one another. This was only a short story but it was very powerful with a lot of emotions flowing through it that me as a reader was able to feel. Hoping their will be more of these two in a longer book in the future cause they are definitely worthy of more. Great book and look forward to reading more by Laquette in the future. This was a sweet story, however, I felt that this was only the beginning of their story. Most of this was about their background, how they came to where they are presently in their life, their relationship and how they see themselves. This was a very quick read, with a lot of information in it. The reader has to quickly understand what’s going on, because LaQuette’s story is fast paced. I wish that there had been more – I felt that this was an unfinished story and one that LaQuette could have drawn a great conclusion with, but chose not to. I am hoping that there will be more to follow, but at the same time, hope that it is not drawn out in to 3 or 4 more books, because that would just be very annoying. Overall though, this was sweet and a great start to what could be a great story. If this book would have been longer I think it would have been better. 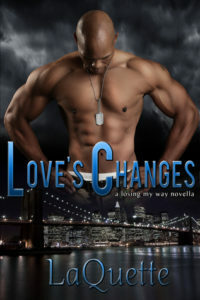 Bryan was shot in the line of duty and realized that he wants to stay with his estranged husband Justice. Justice has wanted to be with Bryan the whole time, while Bryan didn’t but has now decided enough is enough. This was basically just a book with the two of them fighting back and forth on if they should stay together or not and then Justice’s family intervenes and helps them to find out what is best for them both. If we would have gotten more of the back story BEFORE the shooting and not just bits and pieces I think it would have been much better. Writing—her escape from everyday madness—has always been a friend and comforter. She loves writing and devouring romance novels. Although she possesses a graduate degree in English Lit, she’d forego Shakespeare any day to read something hot, lusty, and romantic. She loves hearing from readers and discussing the crazy characters that are running around in her head causing so much trouble.